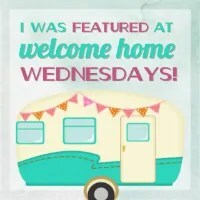 Welcome to Welcome Home Wednesdays # 29! That means next week is the big THREE-O!! That’s right link-party thirty and I’m so thrilled! It’s been a busy week, but I was so excited to visit your sites and see what you’ve been up to! Thank you for the opportunity to bring so many gifted bloggers together! Have a great week and I look forward to seeing you at #overthemoon and #thursdayfavoritethings! And thank you Erin for the invite and introducing me to your blog! So glad to see you here, Marilyn! Thanks for coming by. I will see you soon! Thanks so much for the invite, Erin. Can’t wait to see what everyone else is sharing.I hope you’re having a wonderful week. Thanks you for coming by! Lots of great great links – enjoy! Have a wonderful week too! Yeah! Glad you linked up! Thanks for the follows too! Have a great day! You did a great job with your recipe! Thanks for partying with us! See you next week! Thanks so much for featuring my rusty cans, and for hosting another fun party! Have a wonderful day! You’re so creative! Thanks for linking up with us. See you next week! Hi Erin! Thanks so much to you and the ladies for hosting! Hope you’re having a happy first week of March! It’s hard to believe it’s already March!! Where has the year gone?? Thanks for coming by, Cindy! Thanks so much for the invitation to stop by! I found several recipes and crafts to pin. I can’t wait for next week! Yeah! So nice to see you here, Laura! Please come back next week! Hi Erin, It’s nice to meet you. I linked up and will follow you each. I have been wanting to join new parties. I’m so glad you stopped by! Nice to meet your too, Sherry! Glad you stopping by and joined the party. See you next week! Saw a link on Twitter and came over, so first time here! Thanks for hosting and have a great week!